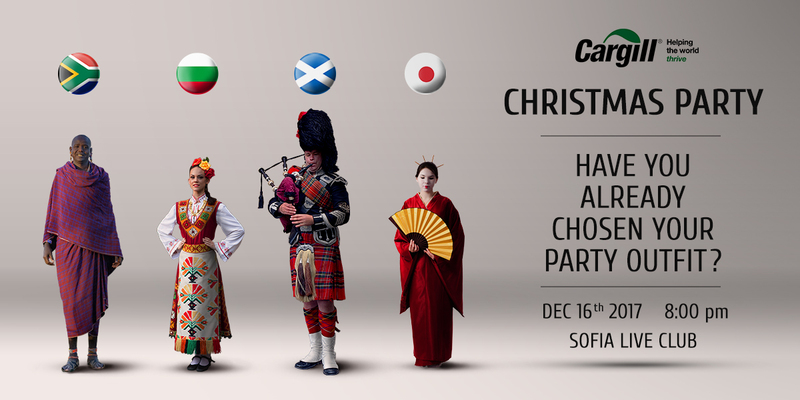 Our team was challenged to create a unique concept and to organize the Christmas party of Cargill – a multinational company with more than 150 years’ history and offices in more than 70 countries. Bulgarian division has more than 700 employees working in different segments of the vast portfolio of the company. THE MAIN GOAL was to inspire the vibrant community of the company and challenge them to show how creative they can be on their Chrismas Party and at the same time the event concept to be closely related to the company culture and international scope. Our team created a simple yet powerful concept – The international Christmas night inspired by the global company and the diversified profile of its markets and employees. During the event, we created special food corners inspired by the international kitchen of 4 continents. The drinks were exotic as well – from tequila to sake. We had a wall of fame and a special photo corner with a green screen where the guests could take pictures on different backgrounds from all over the world. The hosting team was dressed in national costumes. Various international dances took part in the main program of the event. Everybody felt the energy and the vibe dancing together with their colleagues on stage.